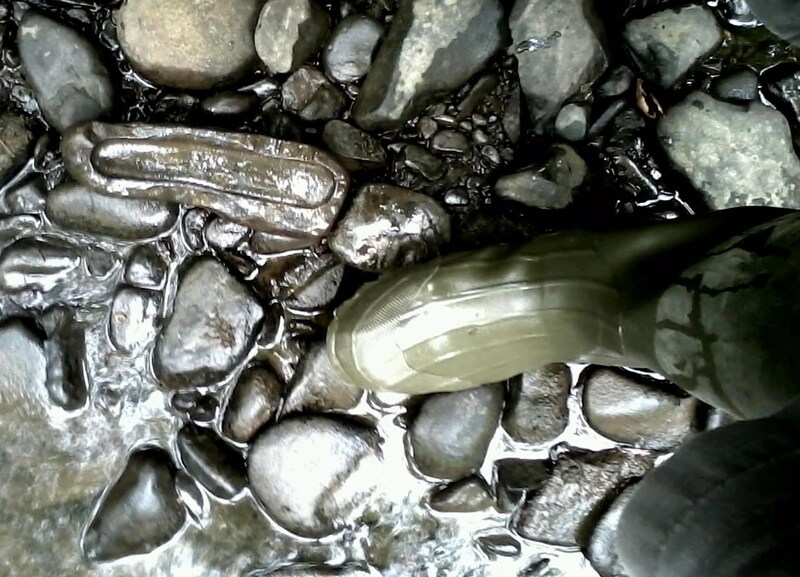 Erosion along the Hannacroix Creek in Southern Albany County, NY, following the impact of Hurricane Irene on the U.S. East Coast in 2012, uncovered a trove of pre-Columbian Paleo-Indian stone tools and artifacts. During the summers of 2013 and 2014, I undertook a series of excursions to a particular place along the Hannacroix where these ancient relics were found. 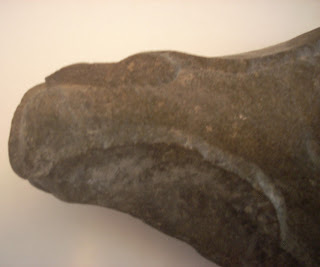 While I found a number of items, two are presented here for consideration: a hammerstone-like formation and another item whose precise identification is unknown – though the features are distinctly man-made. All the items I found were composed of sedimentary rock. While harder rocks were preferred as source material when available, there was a distinct lack of other rock types available in the areas I searched. Further, various types of sedimentary rocks were used as source material for tools, according to Understanding Stone Tools and Archaeological Sites (2000), by Brian Patrick Kooyman of the University of Calgary. The first item, fig. 1, appears to be an irregularly shaped cobblestone formation; however, closer examination reveals sharply defined cut marks outlining the stone (fig. 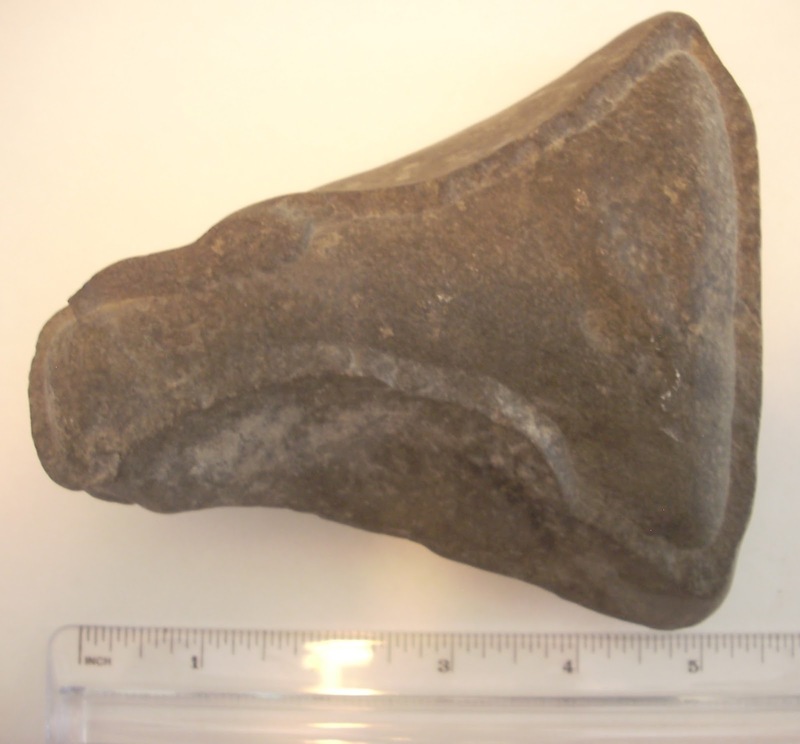 2), which appears to be a matrix for a hammer stone or possibly a rudimentary axe head. It is clearly incomplete, having been abandoned midway through creation. Was it found to be flawed in some way? Was it a practice rock for some young Stone Age apprentice learning his craft? Those who doubt the ability of this type of sedimentary stone to cause damage are invited to experiment themselves. Tests I conducted with similar rocks found at the site reveal them to have acceptable tolerance levels for working with organic material. This part of New York State was scoured by immense glaciers during the last Ice Age which ended approximately 10,000 years ago. Glacial striations can create deep impressions into rocks, so analyzing carved rocks requires a discerning eye. The rock pictured in fig. 3 stood out immediately, which you can see in the accompanying photo taken at the time of discovery. 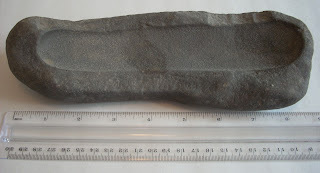 This oblong stone is approximately nine inches long and features a shallow carved-out impression with perfectly rounded ends (fig. 4). The skeptic in me immediately wondered if the items weren’t naturally made – perhaps being a remnant of glacial striation or possibly having flaked off another rock during erosion. Closer examination, however, revealed one edge to have three equally spaced cut marks (fig. 5), perhaps revealing where the maker cut into the rock to begin carving the impression. Further, the impression’s ends are too round, the sides too straight, and too sharply defined for a natural formation. My suspicion that the item was of human origin was further confirmed when a friend forwarded me an article from the University of Texas at Austin web page (Texasbeyondhistory.net) with a photo of a Woodland period artifact (500 B.C.E. – 800 C.E.) from the Jonas Short Mound located on the Angelina River under the Sam Rayburn Reservoir in east Texas (fig. 6). Apart from the different rock type, the similarity between the two items is uncanny. What fascinates me, and many others, about these items is that they were crafted, held, and used by people not so different from myself. Humans long ago held them in their hands as I do now. They stood where I stood and saw the same sunrise and sunset over the same isolated, rural landscape which has seen little change, even in 21st Century New York State. The persons who made these items are long dead and forgotten. The uniqueness of their individual Iives is forever washed away by the tide of history and all that remain are these few stone tools. I wonder, centuries from now, what artifacts from my life will be left for someone to hold and wonder? Will my existence also be washed away and forgotten with the relentless tide of time? I can only hope that there will at least be someone who will wonder – very much the same as I do now.